Your books and maps are of no use if there's no land of righteousness. Aleksei Maksimovich Peshkov [Алексей Максимович Пешков] (28 March 1868 [16 March O.S. ] - 14 June 1936), known primarily by his pen name, Maxim Gorky [Максим Горький], was an influential Russian writer and political activist. Yes, a human being can teach another one kindness — very simply! 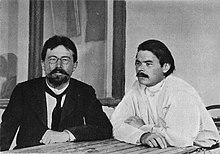 Foma Gordeyev (1899) [also translated as The Man Who Was Afraid; the English music group Led Zeppelin would later name their record label "Swan Song". Everybody, my friend, everybody lives for something better to come. That's why we want respect for every man — who knows what's in him, why he was born and what he can do? There — you say — truth! Truth doesn't always heal a wounded soul. For instance, I knew of a man who believed in a land of righteousness. He said: "Somewhere on this earth there must be a righteous land — and wonderful people live there — good people! They respect each other, help each other, and everything is peaceful and good!" And so that man — who was always searching for this land of righteousness — he was poor and lived miserably — and when things got to be so bad with him that it seemed there was nothing else for him to do except lie down and die — even then he never lost heart — but he'd just smile and say: "Never mind! I can stand it! A little while longer — and I'll have done with this life — and I'll go in search of the righteous land!" — it was his one happiness — the thought of that land. And then to this place — in Siberia, by the way — there came a convict — a learned man with books and maps — yes, a learned man who knew all sorts of things — and the other man said to him: "Do me a favor — show me where is the land of righteousness and how I can get there." At once the learned man opened his books, spread out his maps, and looked and looked and he said — no — he couldn't find this land anywhere . . . everything was correct — all the lands on earth were marked — but not this land of righteousness. The man wouldn't believe it. . . . "It must exist," he said, "look carefully. Otherwise," he says, "your books and maps are of no use if there's no land of righteousness." The learned man was offended. "My plans," he said, "are correct. But there exists no land of righteousness anywhere." Well, then the other man got angry. He'd lived and lived and suffered and suffered, and had believed all the time in the existence of this land — and now, according to the plans, it didn't exist at all. He felt robbed! And he said to the learned man: "Ah — you scum of the earth! You're not a learned man at all — but just a damned cheat!" — and he gave him a good wallop in the eye — then another one . . . [After a moment's silence.] And then he went home and hanged himself. If anyone want to become a socialist in a hurry, he should come to the United States. A time will come when people will forget Gorky’s works, but he himself will hardly be forgotten even in a thousand years.